Good morning…pretty breezy and mild out there to start our Thursday. We’re ahead of a cold front out through the Plains which won’t make it to us till later tomorrow it appears. Storm chances are highest then and will work themselves through the region tomorrow night into early Saturday morning. The weekend is shaping up to be a good one. 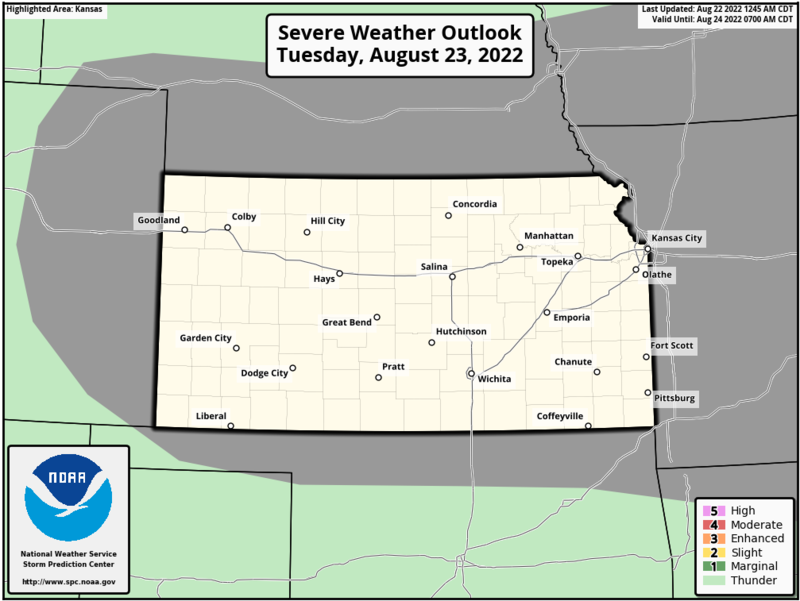 Tonight: Any storms should stay north of KC through the evening (10PM)…there may be some rain across NW MO and NE KS though. I think the football game is dry. We’ll see if something can wander closer to KC after the game into Friday morning (after 10PM). Lows tonight between 70-75°. Friday: Potentially another warm day with highs well into the 80s. This will be contingent on the amount of sunshine we have and whether or not we have a lot of trash clouds left over from any morning storms in the region. So the rain chances tomorrow are there through lunch, then there should be a lull, then as the front gets closer storms may re-fire in the heat of the afternoon with the front. 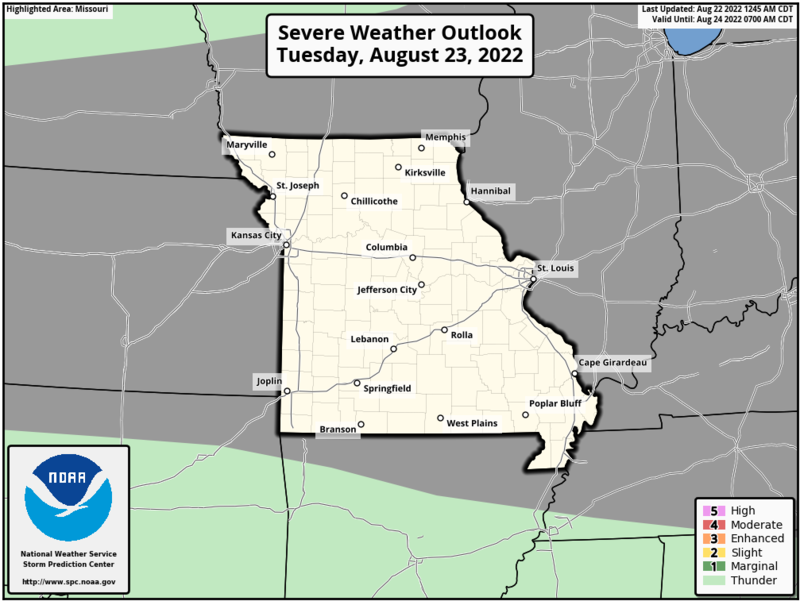 Those storms potentially could be severe. Windy once again regardless it appears. Storms should move out of here by 10PM or so. These storms may impact Sporting KC and the HS football games. The warm September weather continues with temperatures through the 1st 16 days of the month running over 4.5° above average. This is out 26th warmest start to the month in KC weather history. Like I mentioned yesterday the are still strong trends for near to above average temperatures (overall) for the rest of the month…so whatever cool down impacts us this weekend should be rather fleeting. Ahead of the front the south winds in place will stay with us…yesterday we were getting some gusts to around 30 MPH and today should follow suit as well…so it will be windy out there for sure. Radar this morning is showing some storminess out west of KC…these are drifting eastwards and may impact some of the area later this morning…it’s the reason why yesterday I mentioned the small chance of some activity in the area near or before lunch on the weathercasts. Here is the radar from the NWS in Topeka. The rain is being created by some lift associated with the low-level jetstream. That lift will weaken as the jetstream weakens later this morning. If nothing else though we will have some clouds move through the area as the morning moves along. Then the front itself will eventually get through the region later tomorrow. Here is the latest model data (the NAM model) that shows the rain that will overspread the area…this model will update through the day/night as new information is processed. For timing purposes 12Z is 7AM/18Z is 1PM/00Z is 7PM and 06Z is 1AM. Another potential impact is the strength of the storms tomorrow. That aspect is still to be determined because there are questions about instability. Assuming we do see highs tomorrow well into the 80s…we should have enough instability for the potential of severe storms. I mentioned yesterday I anticipated an upgrade from “marginal>slight” risks of severe storms on Friday and indeed the SPC has done that. It’s something to monitor…and the risk would be highest later tomorrow afternoon through Friday evening…again there will be potential impacts for the activities on Friday night. The weekend still looks good. As I mentioned yesterday the longer term forecast is again on the mild to warm side. The latest GEFS (the GFS model ensembles) are painting warmer than average temperatures returning after the weekend through next week and into the end of the month. Click on the image below to make it more readable…basically it goes out 16 days with the “0” line representing average temperatures. The takeaway from this is warmer weather again…average highs towards the end of the month dip into the lower 70s so yes warm but perhaps not to the extreme we’re seeing right now. It’s also a dry look too…not sure how much rain we’ll get after what happens through tomorrow evening in the KC area. OK that’s it for today…I’ll be updating the forecast tonight at 5/6/9/10. Go Chiefs and hopefully it will stay dry throughout the game.